4.21 worked flawlessly (notebook, external monitor via vga, win10, integrated graphics). -Checked “Use Monitor Data for Calibration” makes external monitor greenish. Unchecked returns colors to normal. -f.lux colors don't appear after the monitor comes back from power saving standby. Have to click the f.lux icon in order that they come back. @AlbertBaer Thanks for the note on the monitor...will think about how to make it so we can debug the settings. Regarding standby: which OS version and GPU are you using? And 4.21 did not have the trouble? @herf Yes. I'm back to 4.21 now and f.lux colors are right there when monitor comes back from power saving standby. It's latest Win10 creators update 64bit Pro. And GPU is ancient GM45 ;-). What exactly Software mouse cursor (fixes "white cursor") does in this new build? I see it's not using MouseTrails in the Registry. I know you're looking for an answer from Mike or Lorna, but it looks to me like it's doing the same thing that the Windows Magnifier is doing. @TwoCables Hmm, but the Magnifier process is also not running. But yes, probably isn't something new. Oh I didn't mean to say that I thought the Magnifier was being used. Great! No "coming back from slumber" issue and "greenish color" issue any more on my external monitor with 4.26. The software mouse cursor isn't working for me in 4.26. I went back to 4.25 for now so that I don't have to worry about it until you can check it out. Nice to see Philips Hue integration working again! It controls all lights in the setup, I can not specify individual lights. I only want to control the light behind my screen. Brightness is always set to maximum. I would like to set the brightness myself. It is too bright in the evening. I can not set the max. color temperature. I'm aware, that the Hue integration has no priority, still, it would be very nice to have more options! Hi, nice changelog. Tried the Vignette mode but on multiple monitors, the white spot is in between of the two. Another thing, even I think the interface is not user-friendly. There is more options now, that is great but I'm missing for example the settings button. Now I have to right click and choose the third from top. And move Change location to Settings. Or to main window as button. This is option that is set once and forgotten. It should be somewhere where it is not in the way for other things. When mouse is pointing on the waves diagram, it would be cool to show vertical bar with time stamp so I would see the time. Reason: I set a random location somewhere thousands of kilometers from my location to "pinpoint" settings when it will go down. But I don't see anywhere the exact time. Just guessing. And the last one: Is it really so problematic to add to the main window User-setting of time? Everyone would be happy in my opinion. I understand you had a LOT of work with the location system. But give users the availability to change it to user-specific times. Some people go to be at 8PM, some at 2AM. Night owls. @little-nemo thanks - these things are on our list... and we even have the brightness parameters internally (just no UI for them yet). Hopefully soon (but probably not this version). The reason why Chrome shows when you do that is, it's giving you the option of also disabling f.lux for Chrome in addition to your other program. If you want to undo disabling for a program, then just make that program the last thing in focus before you go to f.lux. You don't need to see the exact time. The ball that's on the curves shows you where you are and what your light sensitivity likely is. It is based entirely on your set wake-up time. So, it's best to just focus on where the ball says you are in your likely light sensitivity based on your wake-up time. If you don't want to tell f.lux when you will be waking up, then tell it when you woke up by simply choosing the time that you got out of bed that day. Simple. :) That way, you'll always be able to look at the ball to see what your most likely light sensitivity is. Adjust your "wake time" and you'll see. Keep doing it and keep studying where the ball ends up. Before long, you will know how to read it. @TwoCables I know how to enable/disable. I was just wondering why after focusing Chrome there is only Chrome and after focusing Sublime there is Chrome and Sublime. But maybe I was just quick and there is some time limit like 10s or sth like that. Currently I am using beta 4.26 version. I have a question and suggestion. How to change the color changing time schedule (like the newly added 'Adjust all color at once')? If it's not available in the application, then is it possible to add this feature. because its always change the color automatically, but I want to set the timing manually. 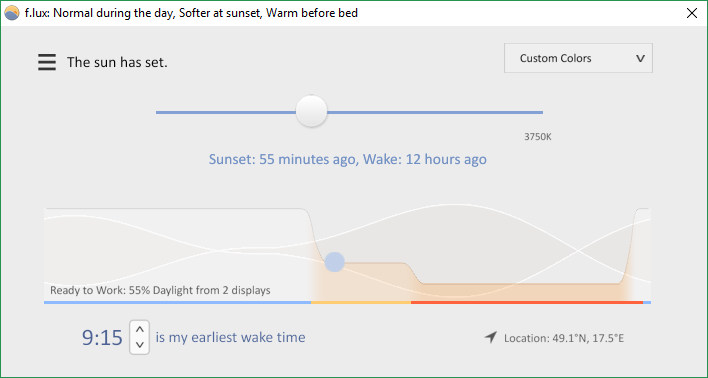 I have found that there is only one time change option available but I want Daytime, Sunset and Bed time change slider at the same time manually. Hope you understand my point. I just told you why. It's doing that so that you can disable Chrome in addition to that other program (multiple programs instead of only 1 at a time). I was not trying to tell you how to disable and enable. I can't tell you when your color temperature will change because I don't know what time you took that screenshot at. I don't know what time zone your in. So again, continually play with your wake time setting and you will soon get a feel for what you are looking at. Is your sunset really in 1 hour? It doesn't matter. What matters is, does that ball really represent where you are in terms of your most likely sensitivity to light? Do you feel that you've been awake long enough that you will want to go to bed in maybe 3-4 hours? Judging from where you are on the curve, you should be thinking about going to bed in a few hours. I use DisplayCAL to calibrate my monitor. Since the 4.22 update where you added "Use Monitor Data", f.lux resets my calibration when I open it no matter what time of day it is and whether or not the "Use Monitor Data" setting is checked. Is there any way for me to fix this? So far I've been forced to return to f.lux 4.21 in order to keep my calibration in tact. I see why you think that. Nevermind. I had a much worse post than this, so yeah this post isn't the original version. It says they've been awake for 12 hours. However, they said they manipulate the time zone quite a bit. So, yeah, I know what I'm looking at here, but considering how unique their usage of f.lux is, I can't go by that screenshot. I'll just try to explain this using my copy of f.lux. Check that out. Pretty much no light sensitivity, just as you would expect. As you would expect, being awake for about 14 hours means you're likely going to begin being very sensitive to light and you will want to think about going to bed within an hour or 2. The location of the ball is right where it should be. There we go. 16 hours. Carefully observe how you feel the next time you've been awake for about 16 hours. Can you see how this works? I can post more examples if it will help. As you can see, one of the goals that Mike and Lorna has is to educate us so that we can improve our quality of life. F.lux is far more than just a simple little program. Thats great! Brightness setting is really welcome! I am looking for fixed mouse cursor (broken in v4.26 - reported here in the another topic). @TwoCables Thank you for this and the post before. Really nice explanation. I'm starting to get it maybe. When I wrote that message, that was the time of my screenshot. I changed location so that it would dim my display right around now (20:00 - 21:00). My screen dims to the Sundown color. So I think it starts around (19:00 - 21:00). My problem is, I want it to start dimming my display at around 20:00 - 21:00, not before. Modifying is my earliest wake time does not help with this. I think. Do I not understand something with f.lux functionality? Mouse fix is rolling out as 4.27 - sorry I just broke the checkbox. @herf Thank you for your work! 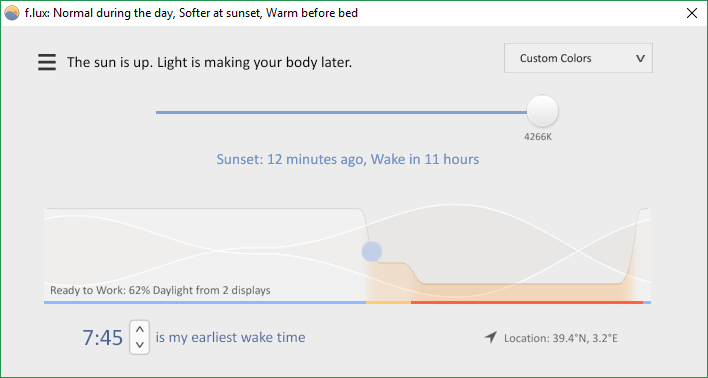 F.lux is really amazing piece of software, must have! I am looking for other improvements and features, keep us updating. P.S. Would be nice to add a link to your website for changelogs/post changelogs for every version here on forum in one thread. @herf can you please explain what exactly Software mouse cursor (fixes "white cursor") does in these last builds? The new build seems to have fixed my calibration issues. I'm not sure how, but thanks. v4.27 - I like the new way how you redesigned the f.lux settings - much better! Just my ideas, sorry for my English, not my native language. I think there should be a way to manually choose a program when configuring autodisable settings. Having to start the program and have it selected is kind of a pain and not always practical. Also, for some reason f.lux un-hides itself from the system tray at start. That's kind of annoying. BTW shouldn't there be an option to stop f.lux from running at startup? I know the point is to integrate the program seamlessly with windows but an option would still be nice. So Windows has these Notification Area Icon settings where you can change stuff on a per app basis, since flux changes path to the exe on every update (assumed) it counts as a new app for those settings and falls back to the default. Can this be avoided? I suggested using Squirrel (https://github.com/Squirrel/) as an updater before, it avoids this by pointing to a stub exe which never changes path/version but if you don't want to use Squirrel, the same technique could be applied here, too. I'm on 4.21 and it doesn't play nice with Windows 10 (toast) notifications. 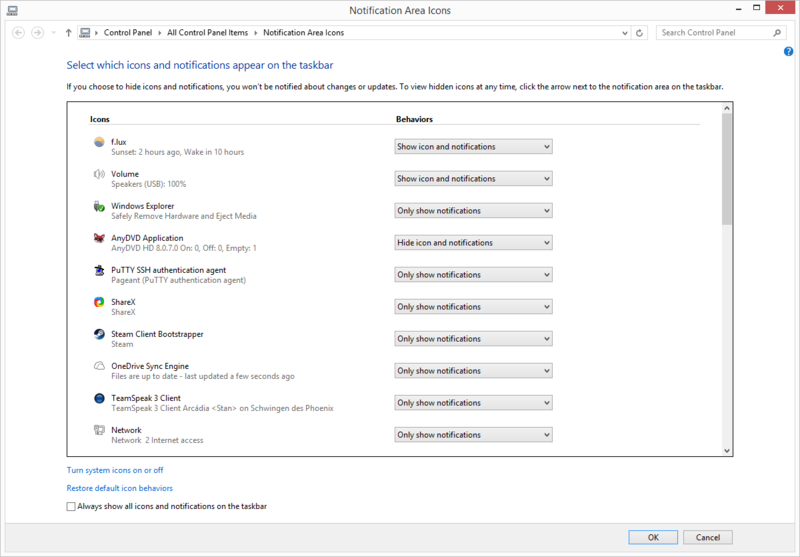 As there is no option in the program's menus, I switch off the sound or even the notification altogether in WIndows Settings (screenshot attached), but after a system restart, f.lux resets the notifications, creating a new entry in the notifications app list. As if f.lux is registering a new instance with the notification system each time. Kind of annoying. I'd love in-program options or a fix for playing nice with Windows system. Otherwise I love what you did with per-app options. Been waiting for it for ages. I don't need it or want it starting with Windows. @TwoCables I usually disable it in the Windows 10 Task Manager or CCleaner when I need to. I find that much easier. I have Windows 7, so I have to delete that Registry sub key. I refuse to use CCleaner for any reason as well. For me, getting it out of the Registry is super fast because I have that main key as one of my Registry 'Favorites' (among others). It's a 'Run' key, and so it's useful for more than just stopping f.lux from starting with Windows. I have no issues caused by the installer. Also, I was using 4.25 when 4.27 was pushed out and I had my automatic updating turned off. Yet, I still got the "f.lux is updating" page even though f.lux didn't update (until I decided to allow it to update). We were talking about having the option be in the UI. We just need a simple option in the UI to choose whether f.lux starts with Windows. That way, the installer can stay simple and those who shouldn't be messing with this won't be enticed to. I have been waiting patiently for the new windows version to come out. However i'm really bummed out that there is no ability to SET CUSTOM TIMES. I live in Alaska, almost NEVER is the sun agreeable with my work and sleep schedule. There were promises in past forum posts by the developers that this was to be included! While I like to travel, constantly changing the location on the Flux map is not what I had in mind. If I have somehow missed it, forgive me and tell me how to do it. If I have not, please consider adding it as soon as possible! There really is no other way this program will be useful for me anymore over Win 10 built in. I've been using the Beta for two weeks or so and I like some of the new features - mainly the ability to automatically go a bit "deeper" late in the night. However there have been some issues as well. One gripe of mine has been the (often mentioned) taskbar bug where the f.lux icon resets itself to the 1st (visible) position on every restart. The other is related to my specific setup which is a dual-monitor: Primary (external HDMI monitor) & Secondary (laptop screen). I've noticed that f.lux beta adjusts my gamma (for the lack of better terminology) on my Primary monitor depending on the Secondary (laptop) monitor's brightness. This happens even during the day. I normally keep my laptop at 25% and external monitor stays always at 30%. However when I play with brightness values on the laptop monitor (for example in the Windows 10 action center) and going from 0% > 25% > 50% >75% > 100% the picture on my primary external monitor changes as well even though its brightness is still set to 30%. 0% brightness on laptop results to something like 1.1 gamma on external monitor (colors look a bit washed-out and the whole picture is sort of like "looking through a fog"). I since switched back to the regular version since it allows me to maintain more vibrant (not so washed-out) colors independently on the brightness settings on my laptop's monitor. Even with only 25% brightness on laptop I'm getting nicer colors (0.9 gamma) on my external screen. @K4m1k4z3 thanks - this should not happen except at the most extreme dimming settings. We will fix.